Tenkar's Tavern: It's Time to Start Thinking "OSR Christmas"
December will be here before we know it and that will mean it will be time for the gifting holiday known as OSR Christmas. This year, we are going to do things a little differently, which should hopefully benefit everyone, gift givers and gift receivers. This year it is going to run for 12 Days straight - December 13th to the 24th. Each of those days I'm going to be giving away AT LEAST a $10 gift certificate to RPGNow. The amount and number of gift certificates depends on how well The Tavern raises funding between now and then, but that is the bare minimum. The Tavern will also be giving away a box of RPG Christmas Cheer on December 24th (ships only to the US - sorry). The value of the box will be significant. Details will follow as we get closer to the holidays. In addition, publishers and other bloggers, fans, whatever should email me their gifting plans and the days will will be running on, what they are gifting, any restrictions, so forth. When The Tavern's gift goes up links to all other gifting for that day will be part of that post. This puts the gift giving and the traffic where it should be, in the hands of those doing the gifting. Something I'm experimenting with this season is Amazon Affiliates. The potential funding added to The Tavern's budget is quite high, although the few times I've added it to The Tavern's website I've seen less than stellar results. 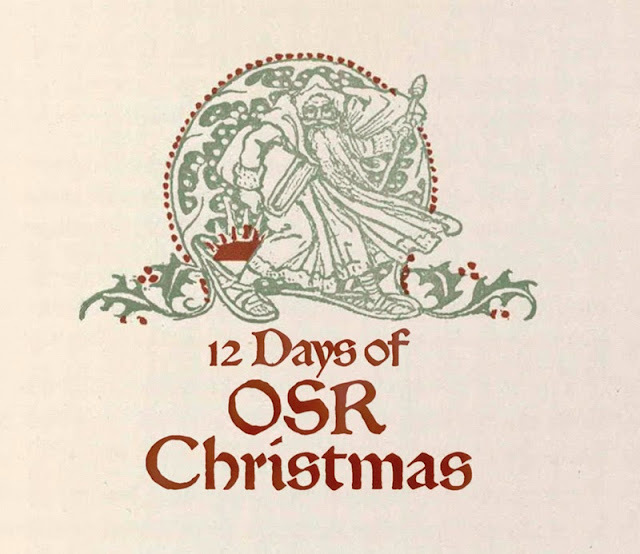 Still, if you plan to shop on Amazon, the extra monies will go directly to the OSR Christmas gift giving. Quite simply, you have the opportunity to add value to the gift pool by doing something you are already doing. As we get closer there will be follow up posts to get the various details locked down as well as how we will handle gift givers that don't have an online location of their own to give their gifts from. Can I gift any GURPS stuff? So anything OSR or from the 70s/80s era is eligible to be given as a gift? Neat. I'll help out. How does the Amazon Affiliate thing work? Just click through the widget on the right when I need to buy more bonito flakes for the cat?